My friend Pat lives on a sweet little lake where I imagine these days she's playing with her two grandchildren on the shore and contemplating what book to read next. Or what quilting pattern to begin. Or what sweater to knit. She's one of those types - good at everything she sets her hand to - and utterly charming to boot. I'm lucky to count her as a friend. And she's a great cook. I can't deny that one reason I lost 17 kilograms upon moving to Japan is that I wasn't sitting at Pat's table happily devouring the delicacies she placed in front of me. (To be clear, I'm not complaining. Pat's food and company are among the best I know, and I'm always glad to feast at her house.) She tries new recipes without hesitation, and then tweaks them to suit her cupboard holdings, taste preferences, and interests. I miss those long evenings spent sampling her latest concoction while telling stories, playing cards, and always laughing long and hard. So, of course when we went home in February her house is one where we stopped and stayed. And, of course, her house is where nearly fifty of our nearest and dearest friends and family joined us for an evening of carousing, game playing, and eating heaps of tasty treats including pesto toast. Pat's husband possesses a bit of a green thumb and along the west side of their home he grows bundles of tomatoes that Pat turns into tomato pie (killer savory pie that has my mouth watering even as I think about it), salads, sauces, and soups. The toast is something of an homage to the summer harvest, and a fantastic appetizer. (I think I ate at least three.) It had me craving my garden even as I soaked up the pleasures of my favorite season. Slice the bread and broil it on both sides until golden brown. (Pat says this reduces the chance of sogginess.) Slice tomatoes and mozzarella. Slather on pesto as you like. Top with a slice of tomato and a slice of mozzarella. Broil again just long enough for the cheese to get gooey. Serve and eat. Or just eat it standing right there at the stove. It's that good. First off I love pesto. Second, I love tomatoes, mozzarella, and bread. What's not to love about this recipe. I am going to make it. Thanks for sharing. Glad you like it, Traci! 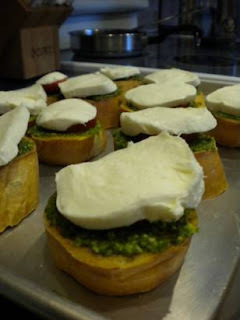 I'm hoping to make our season's first pesto this weekend (or shortly thereafter) and if the weather ever cools down a smidge I'll be making this toast, too. Let me know how it goes and if you've got anything to add! wow this is a great idea for a nice dish to offer if I have friends over! This looks divine. Thanks for sharing! Oh, I'm so glad you are all excited about this recipe! Pat will be, too. Toast away!